Look around the world and notice how old the US system of government is. Germany, France, Japan, China, India, Israel: all remade after World War II. Russia, South Korea, Brazil, Argentina, Indonesia: All emerged from dictatorships or totalitarianism more recently still. In my mental list of “important” countries, only the UK has a system of government that has remained essentially unchanged since before WWII. I’m not positive of the precise age of the monarchies in, say, Bhutan or Morocco, but my guess is that the US has the longest-standing system of government in the world, and by a fair margin. And for all 223 years of the US, it is the US constitution, essentially unchanged, that has defined this system of government. One can look at this in several ways. On the one hand, the constitution must be doing something right to have persisted for so long. And on the other, there are probably ways in which it was built for a world quite different from our current one, and thus probably some major ways it could be amended or re-interpreted that would make it work a lot better. I think one of the most important fault lines between left and right in the US is on precisely this issue: people on the right look at the constitution as essentially a sacred document (almost religious, really), and think it represents holy principles in a pure way. (See this unreasoned blog post for a good example.) In this view, the constitution’s perfection is beyond question, and it is our duty as citizens to defend it and the way of life it represents. People on the left agree with the underlying principles in the document, but are less likely to view the document itself as key. They recognize that other countries have since written other constitutions that do as good a job (or better) of protecting those principles. And they see practical realities of life in a changed and changing world, and want to adapt the constitution to these new realities without losing the most important aspects of the principles. It should be clear that I fall clearly in the latter camp – always a pragmatist, rarely choosing principle over real-world consequences. Much has been made of how the constitution did not foresee many aspects of technology, leaving modern jurists to try to apply the old principles appropriately: what does “unreasonable search and seizure” mean in a world with internet and GPS trackers? Does the ability of the wealthy to gain disproportionate access to new media such as television advertising change the way we think of money and free speech in politics? These are interesting questions, but this post skirts them and tackles a more fundamental issue: the US constitution was written at a time when the world was a much harsher place, and it was designed to avoid the worst things that could happen in that world, not to aid us in further improving the safer, more stable world we inhabit today. Americans (indeed most people) have a tendency to idealize their country’s past, but the reality is that life was pretty harsh 200-250 years ago. I don’t have the precise stats, but I would be surprised if life expectancy or infant mortality were noticeably better than in the developing world today. These two stats may seem like just numbers, but they indicate a world where life was harsh and fickle, where people had to work hard just to get by, but even then had a huge risk of dropping dead for unforeseeable reasons. You didn’t go see a doctor because you had a blemish on your skin, or because you were feeling depressed: you went because you had a major disease or injury. If you beat your kids severely, no social worker was there to help: your kids either survived or they didn’t. And in that world, the US constitution was a major advance: it removed one major uncertainty of life – that the government might do you more harm than good for its own selfish reasons – while at the same time creating a stable government that could advocate for its citizens and protect them on the world stage. While these issues may not have completely disappeared, the main issues confronting the US (and most other nations) today are quite different: how to provide health care and retirement security without going broke, how to regulate multinational corporations in a way that preserves economic growth without handing too much power to unsupervised entities. We have succeeded in solving some of society’s most pressing problems (we should be proud), and our task now is to tweak around the edges to do even better. Our world and our lives are much more stable. What we need now, in order to make further improvements, are not broad-brush principles to protect against the worst of the worst, but flexibility to devise technocratic solutions that will make the best of the best (without, of course, ceding ground on the basic stability and rights we have attained). There are limits to technocracy, but we haven’t reached them all yet, and they will be found gradually by trial and error. While I strongly support Obamacare and believe it is constitutional within the context of the precedents of the last 70-80 years, I also understand why conservatives might read the constitution and disagree. True, the individual mandate is no different in practice than agricultural subsidies, but the application of these legal principles to health care results in a huge, centralized bureaucracy that can effectively dictate to states how to run their health systems. The concept of states’ rights loses all practical meaning in a world where there are always systemic arguments for centralized efficiency in many domains of life. In the world of 1789, most people’s lives were lived start to finish in their local communities, and the idea of centralized efficiencies had no real meaning, except perhaps for the military. From a constitutional purist’s perspective, it is easy to see how health care in the modern world has already (even before Obamacare) moved us into a society that does not conform to original constitutional ideals. And yet these centralized efficiencies provide enormous practical benefits. The FDA, for example, provides clear centralized guidelines for drug approval and labeling. Imagine 50 FDAs in 50 states – that would be a lot of tax dollars in each state going to highly redundant agencies, and the burden for pharmaceutical companies to develop separate clinical trials, packaging, and so forth for small states like Rhode Island and Wyoming would effectively mean that many less common drugs never made it to market. Note that it is not just that our modern world presents problems for which the constitution presents no clear guidance – rather, the constitution does provide clear guidance (states’ rights) in a way that would be completely unworkable in the modern world. So jurists have long concluded that “regulation of interstate commerce” includes the ability to regulate in the national marketplace – certainly not what the founders intended, but a prerequisite for an internationally competitive economy. In 1789, there was no DNA testing. There was no science of how witnesses could have erroneous memories. There was no real knowledge of how often confessions could be false. There were no experts on blood splatter patterns. There was not even an awareness of the uniqueness of fingerprints. Criminal trials must have amounted to “Are we sure he did it, or are we just guessing?” with little clear guidance as to the correct response. Additionally, almost all crimes must have been committed by people well-known within their communities. Viewed in this context, all the protections for the accused found in the bill of rights are probably best viewed as general protections against politically motivated persecutions rather than as protections for a rigorously fair process for normal criminals. Now, we have serious organized crime, we have street gangs, we have cities of millions people where no one knows their neighbours, we have professional criminals, we have computer hackers committing identity theft: the scale and nature of crime, and the consequences for society of leaving it unaddressed, are much larger than they once were. Every criminal justice system needs to find some balance between protecting the rights of the accused and successfully punishing the guilty, two ideals that will often come into conflict given our frequent uncertainty about the truth in any crime. The US constitution favors a balance more toward the rights of the accused, again providing relatively clear guidance. It could certainly be argued, however, that the exigencies of modern crime and society should favor fewer protections for the accused and greater possibilities to successfully prosecute (and thus deter) crime. At one point in my life, I purchased an individual health insurance plan. I read the policy cover-to-cover and it seemed good. Nonetheless, when actually confronted with health expenses, it soon became clear that essentially nothing was covered, due to various loopholes very cleverly hidden. For example, I had purchased a rider to cover diagnostic procedures including mammograms, x-rays, etc. This rider excluded surgeries, an exclusion that seemed like no big deal, except that elsewhere in the policy one could read the definition of surgeries, which included “endoscopies.” Thus, colonoscopies were excluded from the diagnostic procedure rider! After a couple of bad experiences, I re-read the policy and came to the conclusion that the policy had been designed with fraudulent intentions. If one takes as a given that insurance is purchased to prevent worst-case financial scenarios, it was impossible to think of anyone for whom the purchase of this policy would be an intelligent investment: either you were rich enough that you didn’t need it, or it took a fair chunk of your income and still left you exposed to almost unlimited financial risk. In fact, it was so clear that I actually went to see a lawyer about asking for my premiums to be refunded on this basis: it was crystal clear that the policy had been designed to take advantage of the poor knowledge of the health care system possessed by the average consumer. The lawyer replied that he was sure I was right about the policy, but that we had no legal case because it was impossible to prove that there was not a single person on the face of the planet that might have intelligently and in full knowledge purchased the plan. The fact that there was not a sufficient number of such people to create a market was irrelevant, the obvious intentions of the policy’s authors were irrelevant: our legal system is based on the principle of individual harm, not collective statistical harm. The origins of individual-based rather than statistically-based law are much broader than the US constitution alone, but the principle is clearly evident in the enumeration of individual rights in the constitution. There was no reason that the framers could have or should have foreseen the possibility for statistically-based legal principles that exists today; nonetheless, in the modern world, our legal system often ends up favoring large corporations that know how to get away with collective harm as long as the affected individuals cannot be pinpointed. While our current world is still a long, long way from perfect, our remarkable successes in public health, health technology, legal technology, and improving our economy have resulted in a world the framers of the US constitution could not have envisaged. More than presenting issues not addressed in the constitution, these advances (and the ability to further improve on them) are often in direct conflict with the constitution, conflicts that have been resolved by a combination of liberal interpretations of the text and/or a slowing of progress. 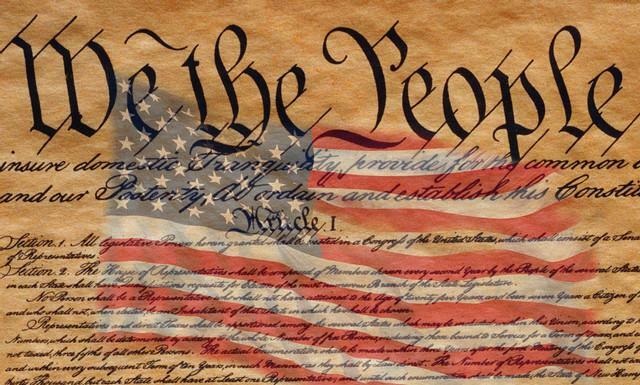 While I have great respect for what the US constitution meant in its time, after 223 years and the examples of other effective constitutions around the world, I think it would be quite appropriate to re-write and update the US constitution with a constitutional convention. I am also certain this will not happen in the near future, given the quite fanatical (and bizarre) constitution worship of the US right-wing. It is a document that deserves our respect, but it is also a document that was written for practical purposes, and for another era. Even Thomas Jefferson once argued for the overthrow of the government every 20 years – while I doubt he meant it quite literally, it is hard to imagine he would have wanted the constitution to remain essentially unchanged and un-updated for 200+ years. Unfortunately, I don’t have many references for this particular post. It is mostly my opinions, not a well-researched document, and I am not a constitutional expert!